The SmartJect® autoinjector is specially designed to help you self-inject—without ever having to see the needle. The easy-to-grip, oval-shaped body makes it easy to hold. One squeeze of a button injects SIMPONI® under the skin. Click here for the Instructions for Use for the SmartJect® autoinjector. Click here for the Instructions for Use for the SmartJect® autoinjector reusable trainer. The SmartJect® autoinjector has been awarded the Ease-of-Use Commendation by the Arthritis Foundation®. Watch videos that walk you through the steps of using the SmartJect® autoinjector. The injection demonstration videos and guides are not meant to replace the Instructions for Use that come with your SIMPONI® medication and SmartJect® autoinjector reusable trainer. Please read those instructions each time prior to using either device. Once your doctor decides you can self-inject using the SmartJect® autoinjector, you can take SIMPONI® at home. For more information on the proper way to inject SIMPONI®, click here or refer to the Medication Guide and Instructions for Use that come with your SIMPONI® medication. Some people prefer to inject with a prefilled syringe—or their doctor may recommend it. SIMPONI® gives you that choice, too. You can use the prefilled syringe at home. The injection demonstration videos and guides are not meant to replace the Instructions for Use that come with your SIMPONI® medication and SmartJect® autoinjector reusable trainer. Please read those instructions prior to using either device. 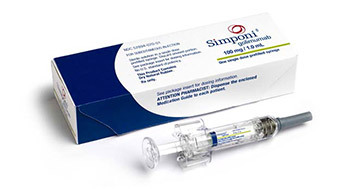 Please refer to the Medication Guide and Instructions for Use included with your SIMPONI® medication for more information on injecting with SIMPONI®. Biologic medications like SIMPONI® require special handling. Specialty pharmacies have experience managing these medicines. For your convenience, the specialty pharmacy can deliver SIMPONI® right to your home. Or if you prefer, it can be shipped to your doctor's office or a hospital where you can pick it up.